Members of the API Legislative Caucus (from left): Assemblymembers Al Muratsuchi of Torrance, Phil Ting of San Francisco, Richard Pan of Sacramento, and Das Williams (vice chair) of Santa Barbara; State Sen. Carol Liu of Glendale; Assemblymembers Paul Fong (chair) of Cupertino and Mariko Yamada of Davis; State Sen. Ted Lieu of Torrance; Assemblymembers Rob Bonta of Oakland and Ed Chau of Alhambra. Not pictured: State Sen. Leland Yee of San Francisco. All are Democrats. “I would like to extend my best wishes for a healthy, prosperous and successful Lunar New Year. “California is home to over 5.5 million Asian and Pacific Islander Americans (APIA). Lunar New Year is predominantly celebrated by the Chinese, Korean, and Southeast Asian American residents of California, and each community have their own unique traditions they carry out in observance of the holiday. The celebration of Lunar New Year in California illustrates the state’s rich cultural diversity. “I truly treasure the holiday as a Chinese American. As we enter into the Year of the Snake, I am told this could be a challenging year that will require serious focus and ardent discipline. The API Legislative Caucus is determined to meet any challenges with strength and conviction to serve the great State of California as we navigate through these turbulent times. “People born in the Year of the Snake are reputed to be thoughtful and wise and to approach problems rationally and logically, seldom instinctively. Famous people born in the Year of the Snake include Queen Elizabeth I, John F. Kennedy, Jacqueline Kennedy, Abraham Lincoln, Martin Luther King, Jr., Pablo Picasso, Edgar Allan Poe and Oprah Winfrey. “My favorite part of the celebration is the opportunity to bring family together for the holiday. Our family will be honoring traditions such as cleaning before the new year, gifting red envelopes and tangerines, and bringing the family together over a festive dinner. I wish everyone safe travels and joyous times as they come together with their loved ones. 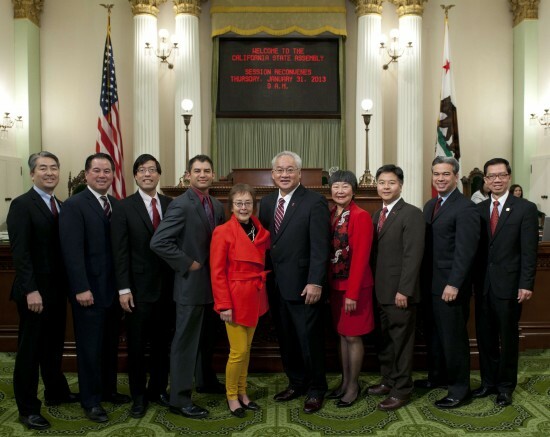 The API Legislative Caucus was established in 2001 with the mission of representing and advocating for the interests of the diverse Asian American and Pacific Islander communities throughout California. Additionally, the caucus seeks to increase Asian Pacific Islander participation and representation in all levels of government. Fong is the new chair and Assemblymember Das Williams (D-Santa Barbara) is the new vice chair.